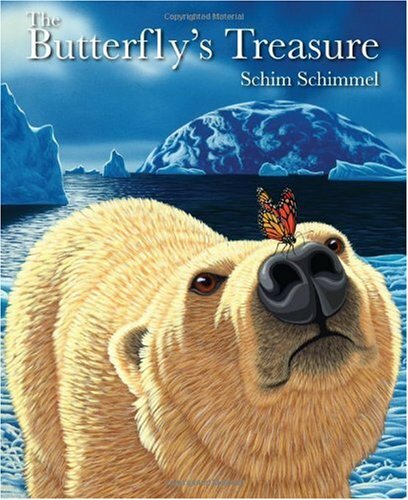 The pages of artist Schim Schimmel’s latest book tell the tale of a monarch butterfly’s mythical journey around the world to discover the earth’s “treasure.” This tattered and travel-weary monarch shares his experience with a caterpillar that is just about to pupate. As the elder imparts his knowledge to the next generation, we follow the butterfly on his journey to the far ends of the earth where he meets many great and diverse creatures. The pages are filled with children’s most beloved animals: polar bear, penguin, seal pup, dolphin and snow leopard cub. Children will no doubt be enchanted by Schimmel’s animals with their large pleading eyes and fur that looks as if you could reach out and touch it. The old monarch tells the caterpillar that these animals share traits with him. The tiger has stripes, the gorilla munches on leaves and the seal pup must shed his fur to mature. As diverse as the earth’s creatures are, their similarities unite them. The message of Schim Schimmel’s art imparts the interdependency of all creatures on the earth. In his words: “All animals, all ecosystems, all people are intimately connected and together make up this precious planet we call earth.” Driving this home, Schimmel has placed a picture of the planet earth on nearly every page, rendering many of the compositions with a surreal New Age feeling. The secret which the old monarch reveals to the caterpillar at the end of his story is that the world is our treasure and all creatures are jewels. The young caterpillar quickly understands that he too is one of these jewels. The old butterfly “puts the caterpillar to bed” repeating the mantra, “This world is your treasure…this world is your treasure” as a lullabye. In reality, the monarch migration takes longer than the life cycle of an individual butterfly. So it is actually completed by the next generation. Not only are all diverse creatures connected, but the generations are equally dependant on one another. The Butterfly’s Treasure and other books which teach children to value all of the earth’s creatures hopefully can help to keep them around for future generations.